Use the previous resource that you were given to correctly re-write these sentences. Refugees are ordinary people who have survived extraordinary circumstances. They are somebody’s mum or dad, brother or sister, aunt or uncle. Every single one has stories of loved ones left behind, of childhoods lost, of a future destroyed. All are asking for the chance for a fresh start – for a safe place to call home to rebuild shattered lives. Refugees and asylum seekers don’t have a choice about where they end up – they are simply running for their lives. The 750 who are settled in New Zealand each year are the lucky few. New Zealand has been formally accepting refugees since before World War II, welcoming 1100 Jewish refugees during the 1930s. In 1944 we accepted 800 Polish people, 734 of whom were orphaned children. New Zealand signed the United Nations Refugee Convention in 1960. The Convention defines who is a refugee and sets out the rights of individuals who are granted asylum as well as the responsibilities of nations that grant asylum. Here in New Zealand we have a strong history of protecting human rights. We have a very good refugee resettlement programme, but we lag far behind other countries in the number of refugees we resettle. New Zealand also has a focus on refugees in special need of protection such as women at risk, people with disabilities or needing medical attention. It set a refugee quota of 800 annually in 1987, but this was reduced to 750 ten years later. The 750 refugee places make a life-changing difference to every single person New Zealand grants refugee status to. However, it is a number that has not been raised in nearly 30 years and needs to be increased. When compared with the rest of the world, it means that New Zealand ranks at 90th in the world per capita, and if you take our wealth into account we drop to an embarrassing 116th in the world. That’s a record none of us can be proud of. 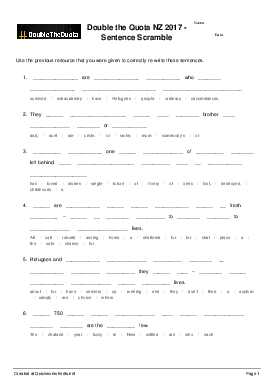 This sentence scrambler worksheet has been created by John Bower, HOD of Social Sciences at McAuley High School. Otahuhu, Auckland New Zealand. This worksheet can be used for any topic on human rights, It has been created for the Level Five Achievement Objective (Understand how people define and seek human rights) of the New Zealand Curriculum. Please feel free to use this resource. Best regards.